Eng. Nikolov, according to the Industrial Collective Employment Agreement, signed on February 5, the minimal salary in the mining industry becomes 784 BGN as the official minimal labor remuneration for the country is multiplied with a factor 1.4. Is this factor from this year or it was accepted earlier? No. It is taken from previous collective agreements with the trade union organizations Confederation of the Independent Trade Unions in Bulgaria and Podrepa Labor Confederation. This good tradition continues and there is a significant increase of the salary, because at the higher base of BGN 560 preserving the escalation factor, a level is reached which will ensure a better life for most workers and employees in the industry. The investment in education which we make through dual training and support to employees who improve their qualification results also into a better workforce quality. Thus, we can apply new technologies and methods in mining industry in a more efficient manner which improves our productivity and creates conditions for sustainable development. What are the average salaries in the mining industry? The average gross salary at Assarel-Medet is about three times higher than the average gross salary in the country and it is the highest in the industry. Employer associations often say that salary should not be increased unless it is bound to labor productivity. In this case, by signing the collective employment agreement, is there any relation to labor productivity? The main condition which must be adhered to when making such management decisions is that the work salary growth shall not outweigh the productivity growth of one person of the staff. There is a developed efficient bonus system Assarel-Medet which is bound to key productivity indices. By the multitude of investments which we make in innovative technologies and automated control technologies we achieve exactly this goal. The comments about a pending recession and a drop in the metal prices are speculative,” says Eng. Delcho Nikolov. What was 2018 for Asarel-Medet? Was it successful? Were there any problems? There are problems everywhere. In mining industry, they are related mostly with the low metal prices at the commodity exchanges. This challenge was faced not only by Assarel-Medet but also by the entire mining sector. Our financial results are quite good. This is due to our decision to make various investments in improving labor efficiency and reducing production costs in our company in previous time periods. Thanks to them, even considering the collapse of metal prices at the world stock exchanges, we have a stable position. Asarel-Medet is a constantly learning organization. We still rely very much on the investments in the operations improvement and on applying best technologies and methods in order to avoid problems in future periods. We rely that based on what we are doing now and on the policies which we have adopted and will continue adopting in the next 20-30, we will create conditions for sustainable operations not only at Assarel-Medet but also in the entire mining industry in order to give our contribution for the national economy and ensure that Bulgaria is progressing. The economists forecast economic downturn at a global scale. A talk is going on about an emerging crisis and even a recession. What are your forecasts about raw material prices, in particular metal prices? Yes, there are comments about a recession and a drop in metal prices. However, these comments are speculative to a great extent. A management which applies the best technologies and methods in any industry ensures sustainable development. This has been proven not only in Assarel-Medet. You also heard the statement of Prof. Nikolayi Valkanov (Chairperson of the Chamber of Mining and Geology and Chairperson of the Board of Directors of Minstroy Holding) and those of other managers of top mining companies that new technologies are the remedy against a crisis, the pathway to success and future sustainable development. The minimal salary in the mining and geology industry is already 784 BGN. This has been stipulated by the Industrial Collective Employment Agreement signed on February 5, 2019. 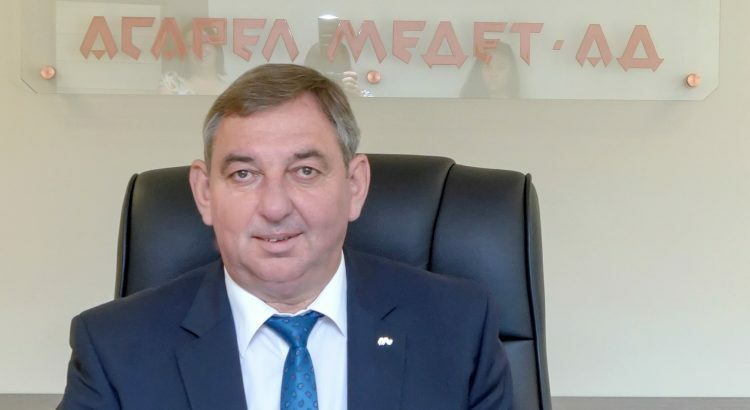 The Chairperson of the Bulgarian Chamber of Mining and Geology, Prof. Nikolai Valkanov, the president of the Federation of Independent Miners’ Trade Unions at the Confederation of the Independent Trade Unions in Bulgaria, eng. Valentin Valchev and the leader of the Miner’s Trade Union at Podkrepa Labor Confederation, Vladimir Topalov affixed their signatures on it. The minimal remuneration in the sector has increased parallel to the national remuneration amount from 510 to 560 BGN multiplied by factor 1.4 since January 1, 2019. Additionally, remuneration at the amount of 0.9% of the basic salary is paid for each year of acquired labor experience for workers and employees on the ground and 1% for underground workers. An increase of the minimal value of free food and allowances at not less than BGN 5 BGN per day worked for workers and employees on the ground and not less than 6.5 BGN for underground workers is among the benefits negotiated between employers and trade unions. The amount of additional labor remuneration for working at night and overtime remuneration of not less than 50% for working at weekends and up to 120% for working on official holidays were also agreed. The agreement envisions additional allowances for both business clothing and working apparels and relaxation time of the employees. It has been concluded for 2 years and will be valid by 2021. More than 23, 000 people are directly employed in the sector which provides approximately 5% of the country’s GDP.